Ever wonder what kids do with stickers that they have worn all day long? Listen lady, I have the answer. Maybe it’s not one of life’s greatest mysteries, but previously used stickers seem to have two fates in our house. Either they vanish into thin air or they manage to go through the washing machine. Occasionally, I’ll find a random princess or rainbow stuck on the bottom of my sock, but, for the most part, stickers typically disappear into some sort of eternal purgatory in our abode. Cardin wears them home, and between the time we get home and she gets a bath, they have disappeared into a Bermuda Triangle. Does this happen with other children? Is it just Cardin, or do all kids have black holes when it comes to stickers. While I was getting her dressed the other night after bath, she clued me in on her secret stash. She is hoarding stickers like its her job!!! She has an entire drawer dedicated to used stickers. Listen lady, this is where stickers go to die. At this point I’m not sure if I should clean these out or be impressed. Maybe I should sign her up for a round of ‘my strange addiction’. I should have expected this. We have to “save” everything for her. Any piece of paper, craft, minuscule fraction of a crumb she doesn’t consume needs to be saved. Now we just tell her we’ll save whatever treasure she has come to love for the present 30 seconds and when she forgets about it, throw it in the garbage and hide it under some other trash. 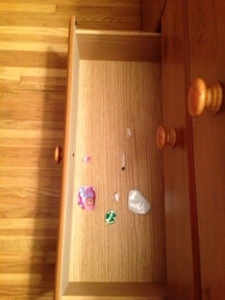 I’m hopeful it’s a phase because we are going to need a bigger house soon if we need drawers to hoard dead stickers.